St. Stephen’s had redecorated their Ambry area. With the new space they wanted a new Ambry. After searching catalogs they decided to have one built. After meeting with their committee and Priest I did a couple rough sketches. Once a direction was chosen I did a more finished sketch (shown here). The finished Ambry (pictured here without the Holy Oils) matches the wood work in the church. It has a light inside the top, two adjustable shelves, a mirrored bottom, and locking doors (the bottom has lockable storage via a hidden door). 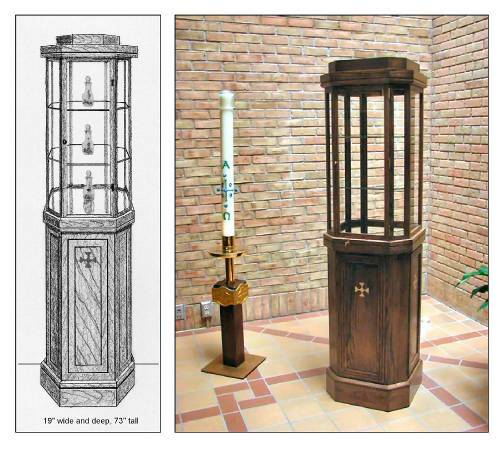 The Ambry was designed in a octagonal shape to symbolize and connect with the Sacrament of Baptism. It also features a cross design that is used throughout the church.